Apple recently removed its first-generation iPod nano replacement program from its support website, over five years after it started. MacRumors contacted a few Apple Authorized Service Providers that confirmed the program has indeed ended, and we were advised to contact Apple directly. Apple's support team initially informed us the program is no longer in place, but a senior AppleCare advisor honored the program after we escalated our request. In other words, if you still have a twelve-year-old iPod nano, you may be in luck still, but it could take some persistence to reach the right person. 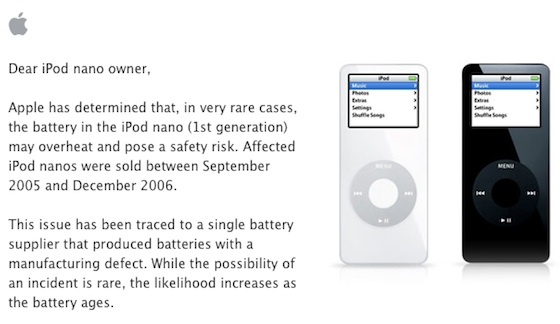 The replacement program was launched worldwide in November 2011 after Apple determined that, in very rare cases, the battery in the first-generation iPod nano may overheat and pose a safety risk. The manufacturing defect is limited to iPod nano models sold between September 2005 and December 2006. I'm curious if anyone still has one of these, and if so, do share a picture! I agree. I'm always glad to see what I consider the most beautiful iPod. You know, my iPhone 7 can do everything my 1st and 2nd gen iPod nanos could do but, for some reason, I miss the simplicity of having a music player so small and well built, with a perfectly simple interface. Yet if you have a 2011 MBP with a failed graphics card you're out of luck! My 1st generation Nano was part of the recall and they sent me the tiny, postage stamp-sized 6th generation Nano as a replacement. While I was glad to get a new iPod with larger capacity and an FM radio, I kind of miss my 1st gen. I still have my original iPod classic. That was my first Apple product. I used to wait 5 mins for iTunes to open using Windows XP, when I finally got a Mac Mini and iTunes opened in 2 seconds my jaw dropped cause I never thought it would open the fast. Goodbye little Nano, I remember when it was just the two of us, Mano a Mano. Perhaps I am reading too much into this, but perhaps this is one of the first steps toward discontinuing iPod nano?